Beautiful new home with water views from every room - great fordiscerning families or 4 couples looking for a touch of luxury, art, and sophistication with their beach vacation. The home has 4 bedrooms, 3 full and 2 half baths. 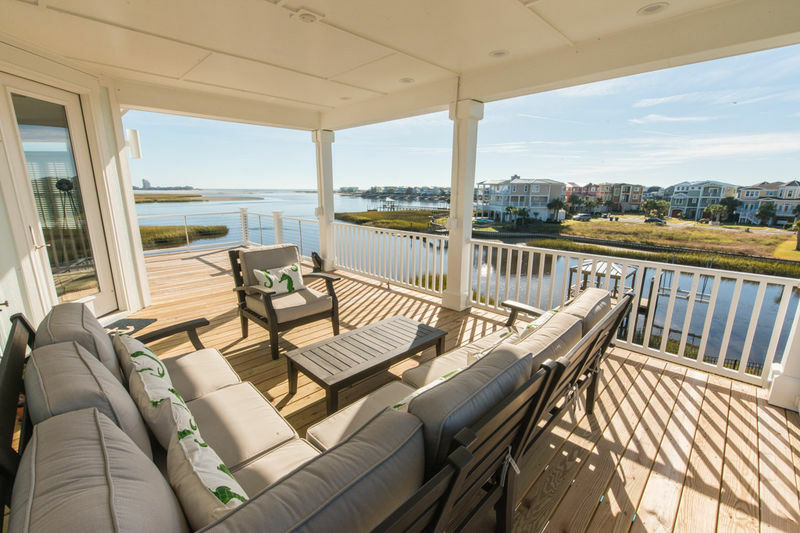 The master bedroom is on the top floor with a private deck to enjoy the sunset over the ICW. Master bath has a large tile steam shower. The main floor has 3 bedrooms and a 2nd living area. Both living areas have large flat-screen TVs and the main living room has a gas fireplace. Beautiful custom kitchen with a gas range and pot filler for the chef in the group; large island allows for plenty of elbow room and seating for 6. Roomy adjacent dining area with a table for 8. Spend a lazy afternoon in the pool, or paddle boarding around the Inlet. Kayaks are also included. Private boat dock for fishing, paddle boarding, and boats. Two bedrooms have king beds and 2 have queen beds. This home has a 3 stop elevator for convenience and multiple decks for your outside enjoyment. BOOK NOW! 10% DISCOUNT ON ANY WEEK RESERVED BEFORE 5/31/19. LOCATION CANNOT BE BEAT!